Quitting a job and moving on to a new one happens with everyone and is very common. About a decade ago, if a person had shifted jobs more than twice in the last five years, he would be considered an unreliable person. Today, this is just not true. The industrial trends show that people stay in jobs for much shorter times (especially in hi-tech & private companies) these days than they did back in the last century. You may have a job offer(s) in hand and may be confident about your financial position. 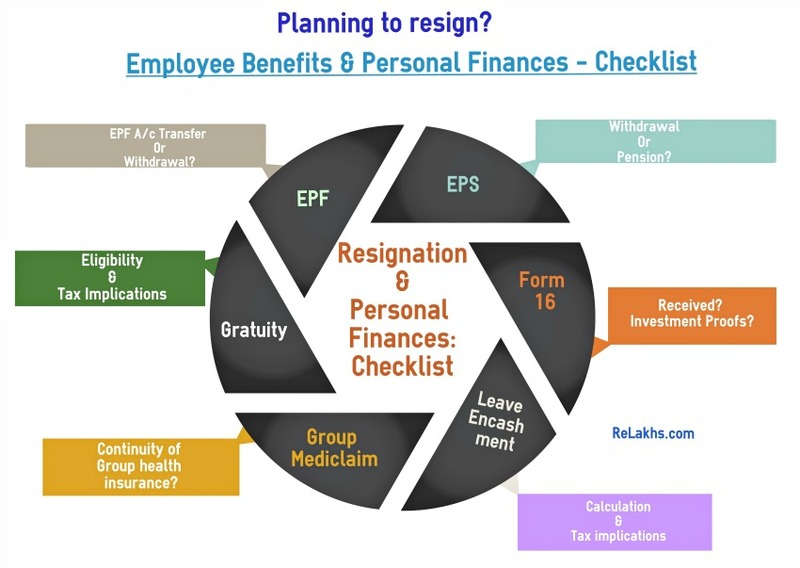 But before you resign or alteast after submitting your resignation paper, it is prudent to check your financial status, savings and details regarding the employee benefits before you leave the company. Most of the companies ask their employees to serve notice period for 1 to 3 months. Some companies make Full & Final settlement before you leave the company and some after leaving the company. 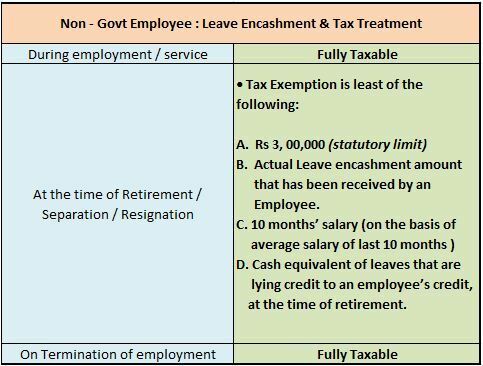 I have observed many employees just ignore calculating the Leave encashment, gratuity, EPF amount etc., before they leave their companies. It is very important to check about various employee benefits applicable to you, about Form-16s or continuity of health insurance benefits etc., before your move out of the company. Lucrative job offer with a better pay scale, or an opportunity to grow higher, whatever the reason may be, making a job switch requires a bit of planning. Here is a checklist on important Employee benefits & things related to Personal Finances. Gratuity Benefit : Gratuity Benefit amount is similar to a bonus, meaning that it is a portion of your salary provided to you, by your employer, for the services rendered on the company’s behalf. Gratuity is a reward for your long and meritorious service. 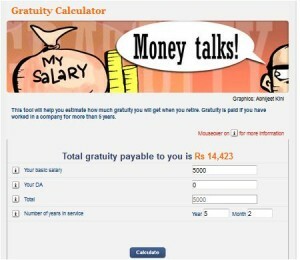 It is mandatory for all the employers with more than 10 employees to pay gratuity benefit. After completing five years of continuous service with the same company, you are eligible to receive the gratuity benefit. Gratuity shall be payable to ‘you’ (employee) on the termination of your employment / after resignation or after rendering continuous service for not less than five years. Employee Pension Scheme : If your total service is less than 9.5 years, you are not entitled for pension. You can apply for Withdrawal benefit. Once, the service period crosses 10 years, the money withdrawal option ceases. You can only get Scheme Certificate and can get pension from the age of 50 years. You have to submit Form 10c for withdrawal and Form 10D for pension. Allowances : Make a note of all the allowances and exemptions that you have claimed with the current employer. Also, check out if you are eligible for any bonuses or rewards. Employer’s Medical Insurance : Check with your employer if your company’s mediclaim policy benefits are available to you after resignation or during notification period (notice period). Else, make sure you make alternative arrangements. Some insurance companies allow employees to convert ‘employee group policy’ into a ‘personal mediclaim policy’ even after the employee leaves the company. The premiums though would be much higher, as the policy no longer falls under the purview of a group policy, but is now an individual one. You could ask if your company lets policy continuity. Have a Contingency Fund : A contingency fund is an emergency fund that would act as a cushion, in case of an emergency, and it should be able to meet your expenses in case things are not fine. When you switch over your job, it may be a while before your salary may start ticking in or maybe there is a waiting period of one month or so before you join your new company. In case you are starting your own new venture, your contingency fund should be at least 6 to 12 months of your expenses to handle the uncertainty involved. Prepare well in advance and build a buffer for unforeseen expenses. Salary Account : You may no longer get the special privileges or reward points or discounts linked to your salary account. The rules applicable to ‘average minimum monthly balance’ may also change. So, do check out this with your banker. Investment Proofs : Prepare a list of all the investment proofs that you have submitted with your current employer. This will be helpful when you have to submit fresh investment proof documents (if any) to your new employer. Notice period buyout: In case if you have to join the new company immediately, you have to be ready to buy out your notice period (if your employer accepts the buyout proposal). Dues / Advances: Clear off all the dues or re-pay salary advances (if any). Make sure you are out of your ‘employment bond’ or ‘training period bond’. Your finances are very important, check your savings and other benefits before you leave the company. Make sure to sort it out with your employer or with your financial planner as to what is the best path to take before leaving your company. Cheers! Wonderful information , simple and short. This is a perfect article I was looking for. Thanks for writing it so crisp with all information included. You can also add on about yearly bonus/Incentives/Joining Bonus (in some cases). For females -Maternity benefit and scope in case of resignation. Is maternity benefit payable after resignation or during notice period. (You are an HR personnel, hence asking you this query). This was a wonderful article, drafted in the fine language which makes it easy to understand. Like me I am sure many working employees will find the article very useful. Thanks for coming up with such wonderful article. I left my last company after 7 years. So i can elegible for gratuity…? My employer never give gratuity to anybody, still can i get that….? Dear Vishal..It is mandatory for all the employers with more than 10 employees to pay gratuity. How many employees were employed? you have wrapped up all that is required for an employee, should be a bookmark post for all the employees.